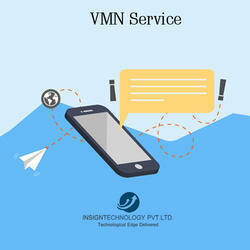 Pioneers in the industry, we offer vmn service and missed call service from India. A Virtual Mobile Number (VMN, SMS Long Number or MSISDN) enables your business or organisation to receive inbound SMS text messages from any mobile user on any mobile network, worldwide. Also known as long numbers or long codes, virtual mobile numbers (VMNs) allow anyone who receives your message to reply using a standard mobile number. Unlike texting a keyword to a short code, which is charged at a premium rate, replying to a VMN costs the standard rate, and is as easy as hitting 'reply' on your handset. This virtual mobile number appears in the sender ID field on the handset, so the user knows they won't be stung with a hefty charge for replying. Missed Call Alert (MCA) is a Lead Generation Service powered by Insign Technology to their Clients across India. This is a Very Useful Service in today’s IT Innovations World. In this we prove a Toll Free Number which when dialed a caller number is registered and if required by our client an auto reply SMS is sent to the caller thanking him for calling and informing him that we have registered his Number and One of our Executive will Call him Back Soon to Understand his requirements / Concerns. This way Caller do not pay any calling fee and Company using our Services receives his Number Instantly and in the return Caller gets a Confirmation SMS that his Number has been Registered.